It’s a lot of hard work and yet, a lot of laughs on Balsam Farms on Long Island, New York. “When you’re working in the fields, much of your work could be thought of as monotonous, but you’re with a lot of people and there’s a lot of joking and laughing….lot’s of funny things happen….if you can’t laugh at some of the problems then you’d be in trouble.” Ian Calder-Piedmonte explains. This now 50-acre vegetable and fruit farm grows produce for upwards of 40 restaurants, sells at six farmers’ markets, maintains many happy customers at their farm stand, and most recently began supplying fresh fruit and vegetables to a local school. 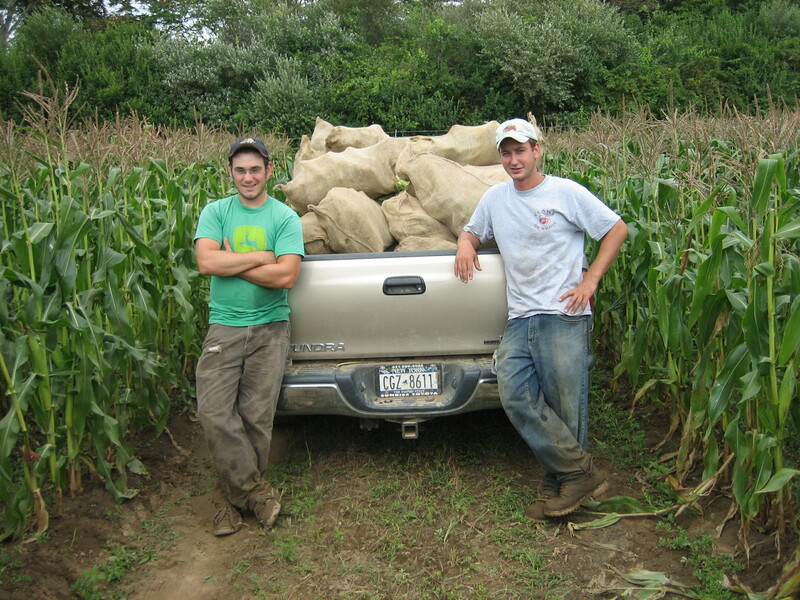 While many people with a degree from Cornell might decide to go the traditional road of a business executive, an engineer, or a doctor, Ian decided to join the ranks of his good friend Alex Balsam, also a Cornell graduate, on his farm. Together, they have created something quite spectacular. Ian was raised on 65 acres in a small Midwestern town. His parents created a bit of a pastoral paradise; raising and training race horses, growing vegetables, fruits, and flowers in their spare time. Ian’s father even had a band, when Ian was very young, aptly named “The Brussel Sprouts”. They would record in one of the side-buildings, “The Grainery”. I asked Ian if his father recorded any songs in ode to any member of the vegetable or fruit kingdom, but alas, there were none. He reassured me, though, that they did record a number of songs about country life. Ian’s mother’s family, The Calders, had and still maintain a very successful dairy, Calder Dairy. “I never worked on the farm,” Ian explains, “but I spent a lot of time there. It played a role in my appreciation for farming”. Growing up, Ian was commuting to and from a college-prep high school in a nearby town, and upon graduation was accepted into Cornell. He met his future partner freshman year. “Alex was always into farming,” Ian explains. Alex Balsam was renting and farming a few acres during the summers while attending Law School. Ian decided to join him for the summer to try it out. “I fell in love with it,” Ian exclaims. I was curious to know Ian and Alex’s keys to financial sustainability. “It’s never really mentioned a lot in discussions of sustainable farming – but it should be” Ian says. “For the first number of years I worked on the side. It’s not a way to get rich quick. We had to carve out our own niche. We worked, and then invested back into the company to grow it. Now, I’m making enough money to live off of. It’s really the love of farming that makes me keep doing it.” But what specifically, I wondered, do he and Alex do to secure and grow their revenue? Balsam Farm’s success is also a result of their attention to quality and to their customers needs. “I often think back to the model of my uncle and grandfather’s at Calder Dairy. They have built a very recognizable brand. They still produce all of their own milk and ice-cream and deliver it in glass bottles. People know when they are buying Calder Dairy, they recognize it and what makes it special. I want a Balsam Farms’ tomato to have the same brand appeal.” Ian explains, “beyond just the quality of produce, it’s about being reliable. We deliver 7 days a week, and if our customers need something, we will get it for them. We have to be consistent. By having a consistent supply, we can almost guarantee we will have an item throughout the course of the season. We try to avoid any sort of gaps.” It’s obvious that Ian also spends a lot of time nourishing his relationships with his customers as well. Even though his business has grown, he still does 70-75% of the deliveries himself. With so much success, albeit it all with a lot of hard work, I can’t wait to see how Balsam Farms evolves. “As a farm it’s important to stay optimistic. Everyone will make mistakes. You can look at them as a lesson learned or a failure. 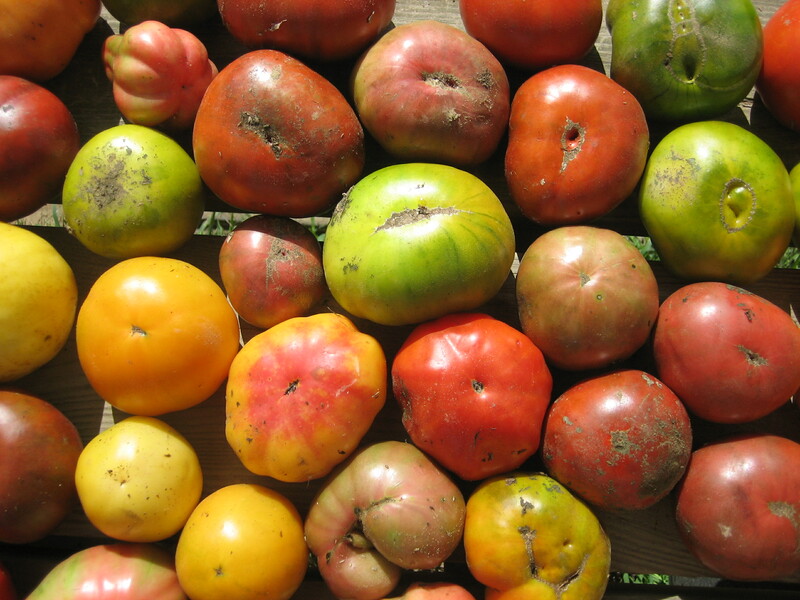 You could really get down about that, or you can learn, and the next year get a little bit better.” With an attitude like that, I know I can plan on being able to stop and enjoy one of those Balsam Farms’ heirloom tomatoes for years to come. The Heirloom Tomato: From Garden to Table: Recipes, Portraits, and History of the World’s Most Beautiful Fruit. This entry was posted in On the Farm and tagged Balsam Farms, cara rosaen, farming, food transparency, Ian Calder-Piedmonte, local food, Real Time Farms, sustainability, young farmers. Bookmark the permalink.